The Lukin – winnin’ or pukin’? 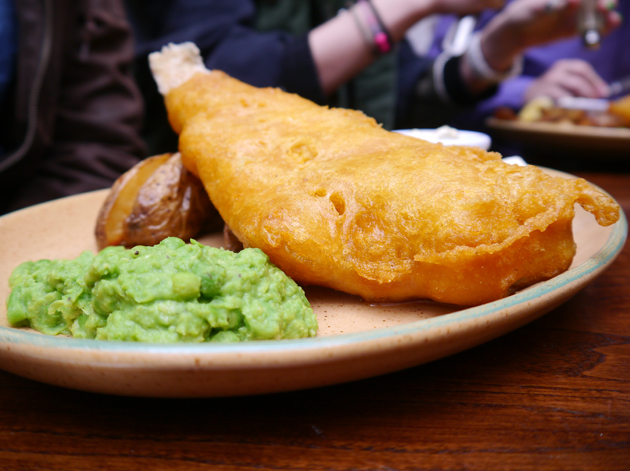 There are plenty of pubs serving food in Fitzrovia and The Lukin is one of them. Sat within spitting distance of the BT Tower, it’s a popular watering hole and lunchtime spot for local residents and office workers alike. I found it to be a merely middling experience though following my weekday lunchtime visit with Templeton Peck, Resume and Socialist Worker. 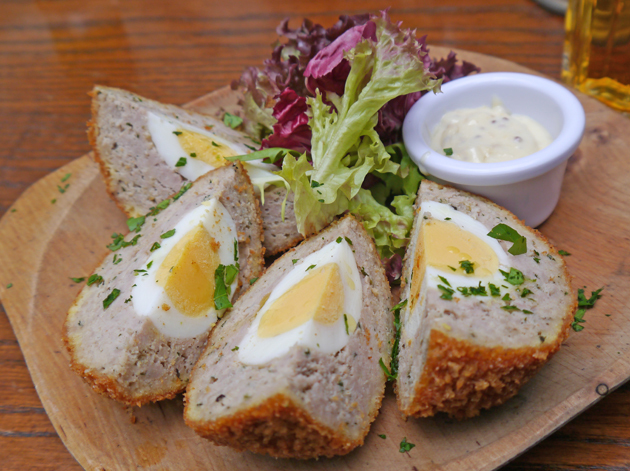 I started off with the scotch egg which was almost large enough to be a meal in of itself. The whopping big egg was quartered, grease-free and covered in a mildly crisp coating. Sadly, the smooth sausage meat was bland and the egg was hard boiled. It wasn’t awful, but it can’t compared to scotch eggs available elsewhere. Oddly, Fortnum and Mason claim to have invented the scotch egg. The same could be said about Templeton Peck’s fish and chips. The golden batter was fluffy, but also a little too oily. The anonymous slab of cod was fine, but hardly anything to write home about. The most notable thing about The Lukin’s version of this pub classic was the chips which were actually skin-on potato wedges. I’ve never seen the attraction of fish and chips. Socialist Worker went against my advice and opted for the burger. 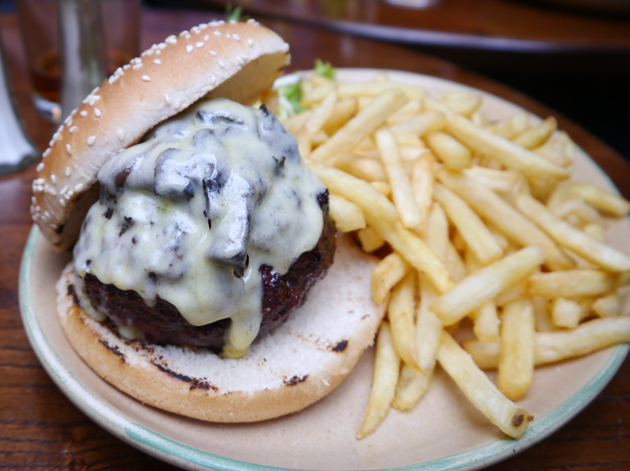 I didn’t expect The Lukin’s burger to compare well against the best burgers in London and it didn’t. 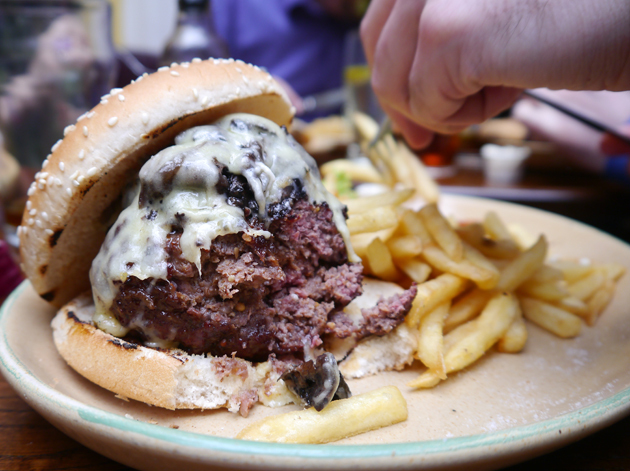 The odd spherical shape of the patty meant this burger had to be eaten with a knife and fork. The patty was made from a moderately coarse grind, but it was a little too chewy and bland as well despite the excessive coating of cheese. 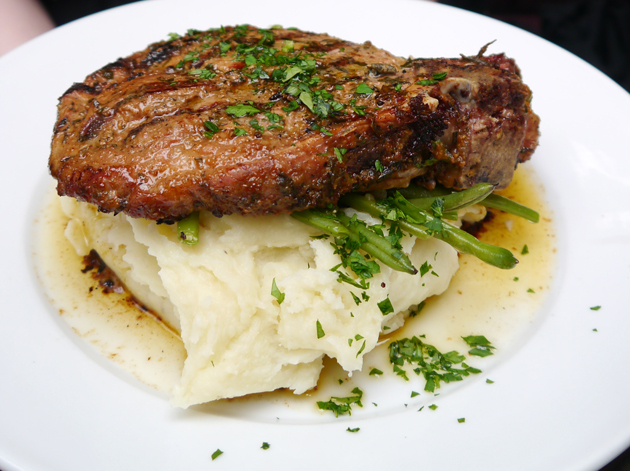 It was cooked done to well-done, so any character the beef may have had was lost. The best thing that could be said about the accompanying fries was that they were free of excess oil. I wonder what burgers are like in Hamburg. Resume was slightly taken aback at the size of her pork chop and I had to help her eat the thing. Despite its epic proportions, it was surprisingly lean. However, apart from a slight hint of sweetness, it was an unremarkable hunk of pig. 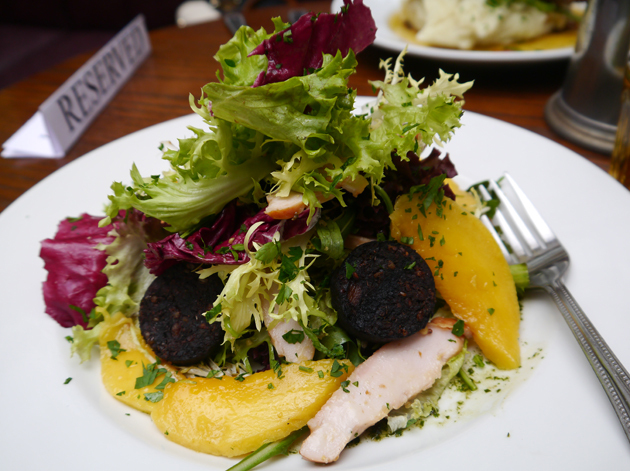 I was underwhelmed by my salad of smoked chicken, black pudding and mango. The strips of smooth and lightly smoked chicken were accompanied by generously large slices of mango, thick chunks of bland, overcooked black pudding and some bitter leaves. The chicken and mango were the more successful elements of this salad, but they didn’t really work well together to form a coherent whole. The Lukin is a very average food pub. It’d be fine as a fall back option when you can’t get into somewhere better, except its inexplicable popularity makes booking a table almost a necessity. There are far worse food pubs in London, but that’s little consolation if you find yourself faced with the mediocrity of The Lukin. Opening Hours: Monday – Friday 11.00-23.00. Saturday and Sunday, private functions only. Average cost for one person including soft drinks: £15-20 approx. Tags: black pudding, burger, chicken, fish and chips, london, mango, pork, restaurant, review, salad, scotch egg, the lukin. Bookmark the permalink.